Slowly but surely I’m upgrading my bedroom. Because this is personal space, I want it to reflect me and be a place that boosts my mood. 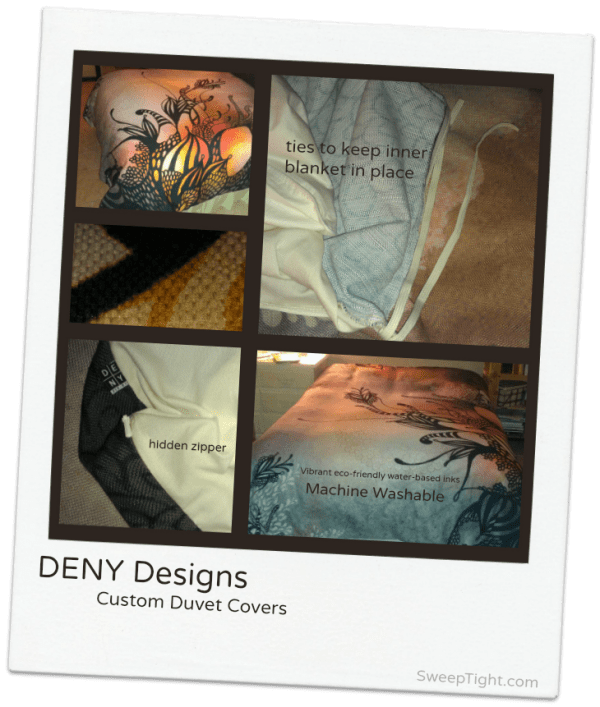 I am thrilled to bring you this review and giveaway opportunity from DENY Designs. I received this custom duvet cover free of charge. All thoughts and opinions are my own. If you have never explored the DENY Designs website, be prepared to spend hours getting lost in a sea of magnificent artwork. It seriously took me hours to pick a favorite… and to be honest I don’t think I could ever just pick one! But for my custom duvet choice I wanted something colorful, but not too overwhelming. I also wanted the design to be sort of feminine but not too flowery. I ended up going with this one, titled Purple Rain, by the artist Iveta Abolina. I love it so much! The quality is outstanding and the colors are exactly what I expected. When it first arrived I washed it in cold water and dried it in the machine and it didn’t fade or shrink one bit. 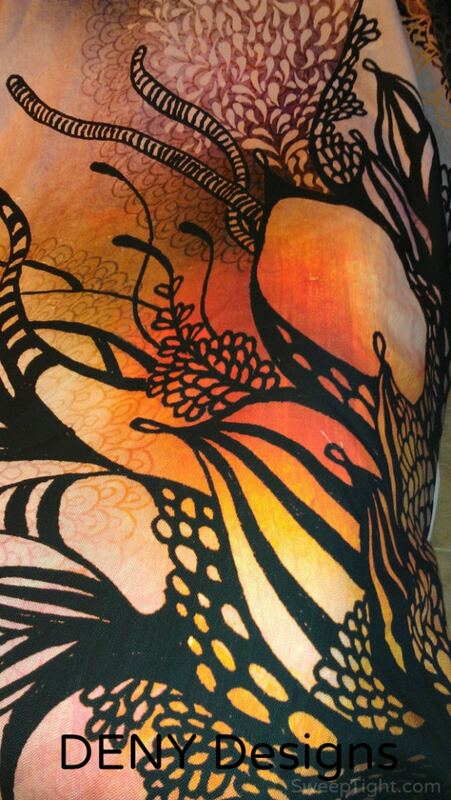 The top is this luxurious woven polyester and the bottom is a soft cotton-poly blend. I put my awesome down comforter inside without struggle. The inside corners have ties to secure the inner blanket in place so your not constantly wrestling around with it. The zipper is tiny and well hidden. I actually have this on my bed the wrong way–the zipper is up by my head. Whoops. But I didn’t even notice! 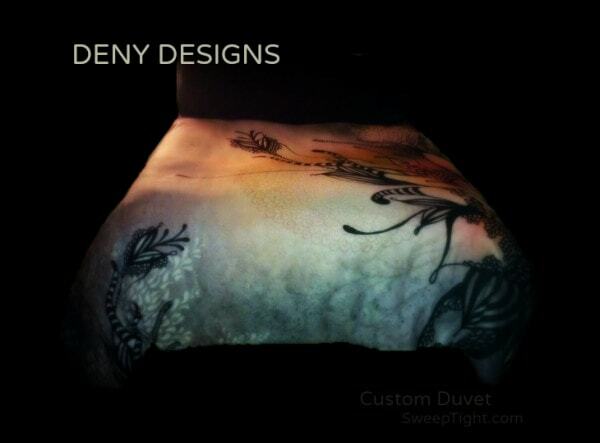 Find out more about DENY Designs on: Facebook, Twitter, and Pinterest. Hi there- I just got my daughter a DENY Designs duvet, which is beautiful! I was super bummed though to see it is Dry Clean Only! She washes her bedding OFTEN. You mention here you washed your duvet- do you still wash it? Thank you so much! Hi Darcy! I turn mine duvet inside-out and wash it probably twice a month with no problems! I don’t remember mine saying dry clean only though? I just ran up and checked for tags, but I cut them off. 🙁 Did it say not to machine wash it in the product description?